Is Mauritius a tax haven? 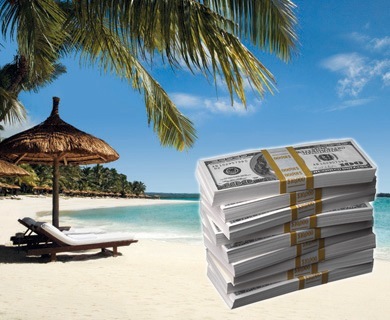 What identifies an area as a tax haven (paradis fiscal) is the existence of a composite tax structure established deliberately to take advantage of, and exploit, a worldwide demand for opportunities to engage in tax avoidance. Two days ago, Eco89, which is a spinoff of Rue89, which describes itself as a “Site d’information et de débat sur l’actualité, indépendant et participatif”, published an articled entitled Maurice, Singapour, Delaware : ma planète off-shore en 3 clics. The article explicitly says that Mauritius is a tax haven because the Category 2 Global Business Licence allows companies from developed countries to evade tax in their own country by setting up their headquarters in Mauritius. The article even mentions that “le nom du propriétaire n’est pas révélé aux autorités” which is something I find very dangerous. Who knows what kind of people own companies in our country? Il existe un paradis fiscal dont le PIB est de 2 milliards de dollars et dont les institutions financières hébergées en son sein ont garanti 1.800 milliards de dollars. Il serait inacceptable que des décisions concrètes ne soient pas mises en œuvre concernant les paradis fiscaux dans les jours qui viennent. Nous voulons un capitalisme d’entrepreneurs et pas un capitalisme de spéculateurs. 62% des hedge funds sont logés dans les paradis fiscaux. Reading these articles as well as the official documents from the Government of Mauritius, I can’t prevent myself feeling very concerned. Is Sarkozy talking of Mauritius? Has Mauritius really become a tax haven? And, more importantly, à qui profite le crime if this is true? Mauritius is just one of many. These tax havens exist all over the world. There are even a few just on France and Britain doorsteps literally (Guernsey, Jersey, etc). To get a clear idea of the proliferation of tax evasion in Mauritius, just search for Mauritius in Google News. You will be amazed at the amount of money transacted by companies “based” in Mauritius. What you have to ask yourself is, if these companies do not declare profits and do not pay taxes to the government, who are benefitting? Having said that, well done for posting on a very relevant topic. Just a few weeks ago, when Brown announced the G20 summit I explained to Priscilla the risks that the proposed regulations would pose to Mauritius. It was also along the same line of thought that I retorted to your post about Mauritius being resilient against the economic crisis. Unfortunately such topics will not be discussed openly by our leaders for obvious reasons. After all, the official line is that Mauritius provides tax incentives to offshore companies not a tax haven. Thanks to a very current topic, I am sending my third comment in a row (the first two typed with T9, and this one from the comfort of a full-size keyboard). A bit of an aside, apparently the Danes are the happiest people in Europe. They are also amongst the richest (Luxembourg, Denmark, Switzerland, Norway, etc.) So it seems money does make one happy after all! “Nous voulons un capitalisme d’entrepreneurs et pas un capitalisme de spéculateurs.”. I completely agree with this statement, it is high time we stop the “Casino economy” where people make profit out of nothing by just having enough capital. As Yunus Mohamed, the creator of Grameen bank, stated the economic downturn should be an opportunity to create a new economic system and the biggest mistake we can make is to repair the faled system which crashed. Speaking of which I just wonder where are the millions of profit which the hotel industry made during the last years that they cannot afford to maintain their workforce for 6 or 76 months until recovery. How does laying off people earning Rs 7000 per month cut cost compared to driving 1500 cc cars instead of BMWs for directors? In Mauritius we don’t have entrepreneurs, we have “des rentiers” who are financed by taxpayers. Some type mistakes in my original post. And “6 or 7 months” instead of “6 or 76 months”. Eddy, you’re really prolific today! Interestingly, some of our major partners (like India) have been ringing some alarm bells lately about Mauritius attracting a lot of tax evaders. Category 2 companies are not tax resident in Mauritius – that means they are resident wherever they are operating and pay their taxes in those countries. For very long, england was the biggest tax haven. As you can imagine, taxation is a way to complicated for any of us to get to grips with it in a blog comment, but ask yourself why are all the rich Non resident indians domiciled in England? Because the tax rules there were favourable to them. Rue89 speaks of Delaware- Delaware is a state in the US. The offshore sector has provided vast employment opportunities to professionals in Mauritius such as company secretaries, accountants, lawyers, etc. If you have the inclination, do some research on how much the offshore management companies (who actually manage these Global business companies) contribute as taxes. Have a look at what is the contribution of the offshore/ financial services sector to the GDP. All countries seek to have favourable tax incentives to investors. The large economies have done it and continue to do it. When small countries like Mauritius do it, and become competitive in the financial services world, suddenly you will hear cries of tax havens! Maybe we should understand a little more, and criticise a little less! In your comment, you said that offshore companies which manage the Category 2 Global Business companies do employ a lot of Mauritians and pay taxes. Very well. But my post was about the Category 2 Global Business companies themselves and not about the offshore companies which manage them. As the Category 2 companies don’t pay taxes and don’t directly employ a lot of Mauritians (as far as I understand), what do they really directly contribute to our country? How can I be sure that they are not owned by people who are involved in dangerous or immoral activities? Why does the Republic of Mauritius has a law which allows for the incorporation of such companies? I’m sure there must at least one good reason. But which one? Sepaking about the treaty we have with India, once in a while you hear an Indian reporter questioning this for such a small country like Mauritius. I suppose one of the reasons we have such a treaty is because we have a special relationship with India and it wanted to help Mauritian companies invest there. Unfortunately it sems that anything that is Indian, be it products, services etc., are looked down in Mauritius due to some superiority complex so instead of Mauritian companies benefiting from the treaty its the American and Europena companies who tranistted their investment to India through Mauritius. when looking at what benefits the offshore sector brings, you cannot seperate the services which management companies provide from the offshore companies themselves. All the offshore companies require a management company to administer and manage them, and therefore, as far as mauritius is concerned, the contribution of the management companies cannot be overlooked. the companies you refer to contribute substantial work to the management companies (whose sole activity is to administer these GBC companies) which in turns employs people, and pay taxes. GBC2 companies do not operate in mauritius. Why should the profits they make from operations outside mauritius be taxed in Mauritius? If you were to go and work in, say the States, would you be prepared to pay your taxes in Mauritius in addition to the taxes you would pay in the States? All GBC companies are monitored by the Management company. They are required to report on the activities of the GBC to the FSC or other competent authorities if the laws are not being respected. GBCs are not allowed to do any business they wish; what they can and cannot do is regulated by the FSC and the law. GBC 2s can be very useful when structuring investments. It is a low-cost vehicle available, and is part of the palette of vehicles available. For example, if I wanted to set up a company in Mauritius for reasons other than tax (e.g. cost of incorporation, political stability, time zone, etc), I would use a GBC 2. Remember that we are living in a global village, and when anybody wants to set up a company or needs a vehicle to make an investment, the world is his oyster and he will check where he gets a better deal. We may not realise what is the value of political stability, but if you look deeper, you will find the number of south africans setting up companies in Mauritius to hold their assets because they are afraid of the future there! This is because I have been waiting for the f-hit to hit the s-an for some time now, and your timely post about tax havens is a good sign that knowledge of such financial tricks is becoming mainstream. True, and if you have been following Mauritius-related news on Google News, you would know that there are major debates and court cases in India about double taxation — India’s government trying to recoup lost taxes. The latest development, it appears, is that a precedent has now been set and Indian companies operating from tax havens are liable to tax paid on capital gains. Have a look at what is the contribution of the offshore/ financial services sector to the GDP. That is irrelevant if the money is not channelled towards improving the country as paid taxes would. Yes, it gives Mauritius some sort of status — although the perception of that status will change *when* international regulations against tax havens are put in place — but as far as job creation is concerned, the only work done is by a handful of people (lawyers and nameplate engravers mostly — because, yes, a nameplate on a building is about the only presence these companies have in Mauritius). Tax havens per se are not the problem, as Peter says. After all, they provide tax incentives albeit to the extreme. What is the problem is the way that companies take advantage of the obscurity provided by said tax havens for illegal transactions. For regulation to work, governments will have to know what companies are up to even if they cannot take taxes out of the money transacted. I feel that we should be immediately concerned by what Sarkozy said on the subject. The financial sector in Mauritius has thrived by the mere existence of GBL2 & the non-double taxation agreement with India. Today we are assisting at the aftermath of the financial sector crisis, massive capital injection from states is required to revive their real economy. Tax havens profit to tax evaders and not their state and that’s why in my opinion the financial sector in Mauritius must get prepared to the worst. Thanks for the link Jin. I’ve read the article but I’ve not (yet) been able to understand all the implications… I’ll have to read it again once or twice. According to Indian finance ministry sources, the total gain to Mauritius on account of the treaty works to only Rs 100 crore a year in terms of licence fees, renewal fees and so on, and only around 1,000 people are employed directly in the management companies. “It is evident that the loss of revenue on account of just 20 companies is more for India than the total gain to the Mauritian economy,” says a source. That list reminded me of something, when i checked out their status on webehigh, [which keeps a list of countries about the conditions of weeds in which countries, all of these countries have a status of 4 on marijuana, i.e 1=VERY ILLEGAL, 5 being =VIRTUALLY LEGAL]. Hell, they are bound to be “happy people” there! coming back to the topic, i guess, being a tax haven is somewhat profitable for a developing country, specially to cut down unemployment rates. But then, its really unfair that locals do not get to enjoy this! and yes i noticed something about offshore… HELL those are the new “colons”. i don’t know if people have noticed but many people who are into those stuffs [specially my accountants and programmers] they get stuck in a slave kind of job with a low pay. ]. Heard on Radio one this morning. A company was made to pay millions in INdia despite being registered in Mauritius because, the court claimed, it made the profit in India. That would be E*Trade Mauritius operating in India with HQ in Mauritius. Good news, Mauritius is not in the black list of tax haven issued by OECD (list requested by the G-20) but our country is in fact in the white list. Also, It is very interesting to read from the OECD website which refers to the white list as “Jurisdictions that have substantially implemented the internationally agreed tax standard” (The link is: http://www.oecd.org/dataoecd/38/14/42497950.pdf ). So… do we conclude that Mauritius is not a tax haven? Despite the India issue? I see this as very good news. seems to me more like some major reshuffling and manipulations, mauritius should have been in that [yes a mauritian saying that sounds weird], but it doesn’t make sense. ohh well, i don’t understand much about economics :p so i guess… my analysis isn’t worth much :D but that’s my layman view on that. I’ve just read some articles on the G-20 summit and I don’t understand why all the Western world leaders are rejoicing. For instance, they have said that they will inject 1000 billion USD into the world economy… but where will that money come from? From the BRIC countries: Brazil, Russia, India and China! Yesterday, on Canal+, Raffarin (a previous Prime Minister of France) was explaining how China has become the banker of all Americans and many Europeans. But he also said that he does not believe any expert now and they, like most of us, cannot understand what’s happening and, more importantly, cannot possibly predict what will happen in the future. The exact term is chaos theory. The economy has evolved into something so complex that it’s beyond the control of market forces. It’s just an illusion of control. If anyone believes Mauritius can get away with dirty money for long, read this. This is an interesting article… Il n’y a pas de fumée sans feu, n’est ce pas? No matter how we feel about this issue, I suppose most of us will agree that our current financial system is built on some false assumptions and something needs to be done before it’s too late. It might be a little late, but i’d like to add something to this thread: i had the opportunity to meet the Director of the Financial Intelligence Unit last week, and i asked him to explain what a tax haven really is. He answered there is some confusion as to the term. A tax haven is most of the time a tiny country where there are absolutely no laws concerning money-laundering, there is no transparency, no accountability, nothing. People can do whatever they want with their money and nobody gives a rat’s fart. He cited Gibraltar, San Marino, etc, as example. He also pointed out that Mauritius could not fall in that definition, because we do have laws AND institutions relating to money-laundering, corruption, etc. Our situation is not comparable to that in Gibraltar and the rest of those rock island tax havens. We are not a tax haven. That article cited by Bahamas above suggests no more than the fact that the man had difficulty obtaining information here. That does not by any stretch of the imagination mean that we are a tax haven! The financial world has collapsed because of abuses. And despite laws. No, the financial world collapsed because of a systemic problem with banks. It was in fact a lack of laws, a lack of proper regulations and sound frameworks that brought about the credit crunch. I am no economist, but even i know that sub-prime mortgages have to be very well regulated, because of the high risk that the debts won’t be paid. Lack of regulation, and even deregulation, brought about the financial crisis. The thing is that people have been abusing the system for decades now. Economists have no clue how the financial “casino” works. See this for instance. Air Mauritius: Where did it go wrong? Ideas to make Mauritius better!